In 2009, McDonald's Sold It's Last Meal In Iceland, This Is How It Looks Today! In 2009, McDonald’s Sold It’s Last Meal In Iceland, This Is How It Looks Today! It seems as though these “ancient treasures” from McDonald’s just keep popping up across the Internet. 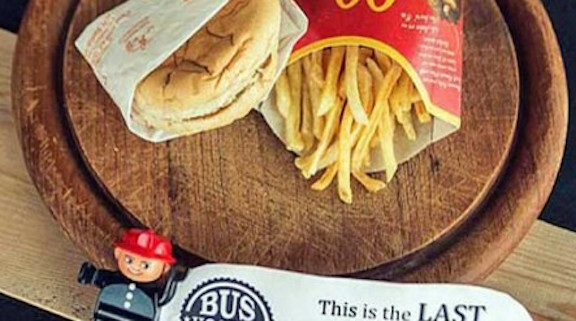 Again, we see a well preserved meal from McDonald’s that is over 5 years old. In 2009, on McDonald’s last day of operation in Iceland, Hjortur Smarason bought the meal as a souvenir – as a piece of history. The burger and fries that were sold in Iceland on October 31, 2009 are now a historic museum piece. Left to rot in Iceland’s National Museum, the “fresh” mold free meal is now on display at the Bus Hostile where awe-struck people watch it’s extremely slow decomposition. This should really make you think twice before you go out to eat those fast food burgers. This really can’t be good for you! The Gross Creature Found In That Can Of Tuna Is Even Grosser Than You Thought!